You are here: Home / Auto Accident / Is Legal Pot Use Leading to More Car Accidents? Early research shows that car accident rates may be higher in states that have legalized medical and recreational marijuana. The research, however, may be skewed because THC, the intoxicating ingredient in marijuana, stays in the system for a long period of time. Therefore, someone driving a car involved in an accident may test positive for the substance, but that does not guarantee his or her ingestion contributed to the accident itself. According to the Insurance Institute for Highway Safety (IIHS), car accidents are up by about 6% in Colorado, Nevada, Oregon, and Washington, compared with neighboring states that haven’t legalized marijuana for recreational use. The Highway Loss Data Institute (HLDI) is a nonprofit research organization that publishes insurance loss statistics on most car, SUV, pickup truck, and motorcycle models in the United States and Canada. HLDI published a report in 2017 showing an analysis of insurance losses in Colorado, Oregon, and Washington that found that legalizing recreational marijuana use in the three states was associated with a 2.7% increase in the frequency of collision claims per insured vehicle per year relative to nearby control states—states that have not yet legalized recreational marijuana. Another study by the IIHS looked at police-reported car crashes both before and after retail sales of pot began in Colorado, Oregon, and Washington from 2012 to 2016. The data from those states showed a 5.2% increase in the rate of crashes per million vehicle registrations, compared with neighboring states that didn’t legalize marijuana sales. One factor that makes “driving while high” statistics murky is that THC stays in the system long after marijuana is smoked or ingested, so someone may test positive for the drug but not be high at the time of the accident. Also, while there are Breathalyzer tests to quickly tell if someone is driving under the influence of alcohol, no such test to definitively prove if a driver is high on marijuana is available yet. 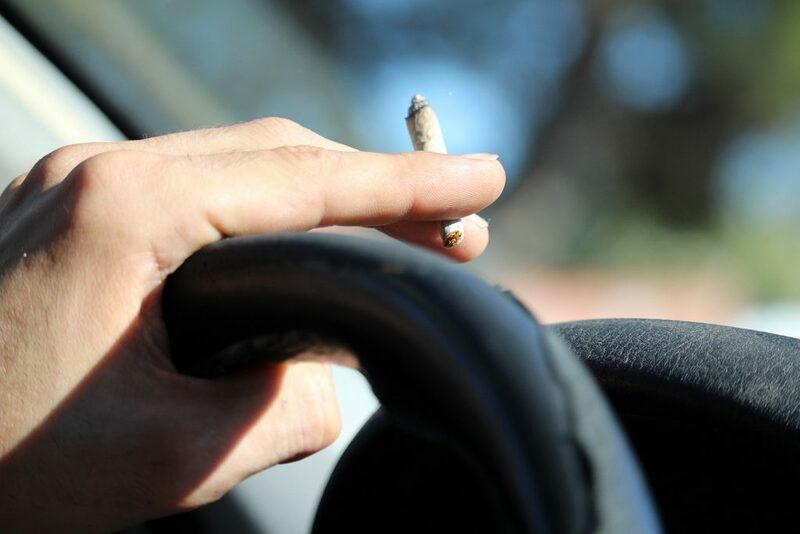 In 2017, the IIHS conducted a study in which researchers discovered that a small sample of drivers who smoked pot before driving had slower skills related to thinking and perception. Drivers under the influence of marijuana tended to weave more when given driving simulation tests. Most scientists agree that preliminary tests show that more research must be done to better ascertain the correlation of THC in the body and its impact on driving ability. While more and more states are passing legislation to legalize medical and recreational marijuana for their residents, one fact about marijuana remains: Driving under the influence of marijuana is a serious crime punishable by hefty fines, loss of driving privilege, and/or jail time. Moreover, car accident attorneys are can use marijuana consumption to prove negligence in motor vehicle accident lawsuits.